How do I Identify British Pewter Marks? It is often difficult, but not impossible, to decipher which of the five main categories a British pewter mark fits into, because many marks have similar qualities. Touch marks, hallmarks, quality marks, labels and catalogue numbers were the primary markings found on British pewter until the 20th century. Depending on the pewter mark, if the pewterer added one, the age of the pewter piece can also be determined. Rule out easily defined pewter marks. 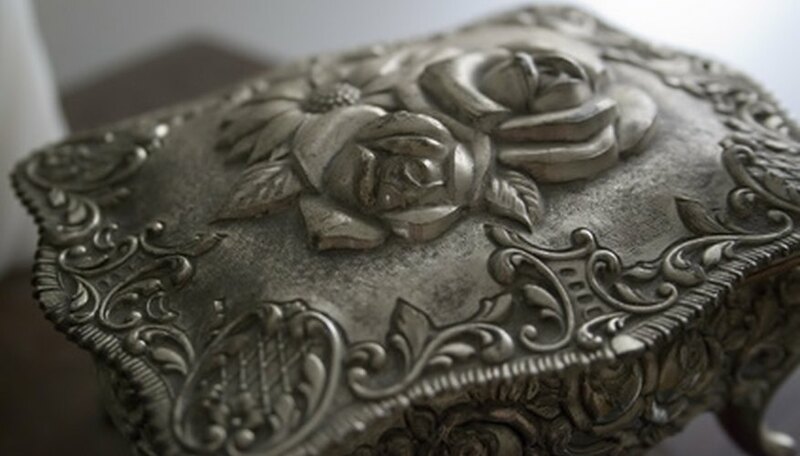 Quality marks are found with a crowned rose or crowned X, which were used to denote the quality of the pewter. These marks stopped appearing in the 18th century. Label pewter marks contain ad slogans such as "Superfine Hard Metal" or "Made in London." If a three- to five-digit number, sometimes with a letter, appears on the pewter, it is a catalogue number. Look for names or initials on the pewter. Initials denote touch marks or hallmarks. Touch marks vary in size and style and may contain a date. If a date and initials appear on the pewter, it is most likely a touch mark. This may or may not help identify the creator of the pewter as they were only required to register their marks in certain cities. Examine the pewter mark for hallmarks, which are representative of the marks silversmiths would add to silver to denote the quality of the metal. Hallmarks may be confused with touch marks because there were no guidelines for touch marks; however, hallmarks usually contain pictures and are similar to the marks that appeared on silver. Read words printed on pewter. If half pint, pint or other form of measurement appears on the pewter, it is considered a merchant's mark. Check inside a pewter cup or mug for a maker's name and address. This mark is known as a pot touch mark. Turn the pewter piece around so you can check all sides of the piece. If initials in a triangular shape appear, it is an ownership mark. The large letter will be the initial of the last name and the two side letters are the initials of the first names of the husband and wife. The five common British pewter marks may be found anywhere on the pewter piece. If you find pewter with a label stating it was made in London, do not necessarily trust the mark. Many pewterers added the phrase even if the pewter was made elsewhere because London pewter was considered superior in the 18th and 19th centuries. Mary Beth Swayne is a freelance writer whose work has appeared in newspapers including the Greater Philadelphia Newspaper network. She has also written for seven magazines and non-profit organization publications. She holds a Bachelor of Arts in English from Pennsylvania State University. How do I Tell If Something Is Not Real Pewter?